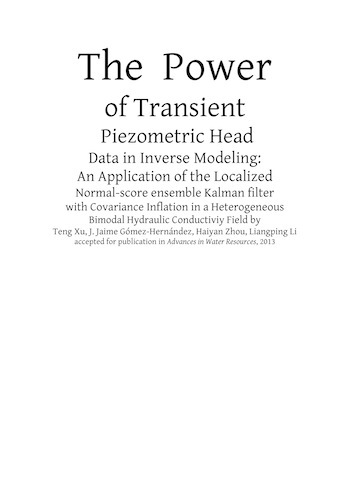 El que va a ser, sin duda, el artículo con el título más largo jamás escrito (por mí): Teng Xu, J. Jaime Gómez-Hernández, Haiyan Zhou, Liangpin Li, The Power of Transient Piezometric Head Data in Inverse Modeling: An Application of the Localized Normal-score EnKF with Covariance Inflation in a Heterogenous Bimodal Hydraulic Conductivity Field, Advances in Water Resources, accepted, 2013. Please don’t feel bad. We can read the comments, and see that there was no reason for a ‘thumbs down’, so we just let it go without another thought. I also counter the ‘thumbs down’ with a ‘thumbs up’! Well-loved. you’re truly a good webmaster. The web site loading speed is amazing. It seems that you’re doing any unique trick. In addition, The contents are masterpiece. you’ve done a wonderful job in this subject!